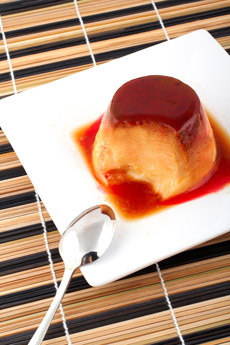 A delicious dish of flan, or crème caramel. Photo by Rafa Irusta | Dreamstime. This glossary includes not only the different types of custard, but the recipes that use them; for example, that favorite French pastry, the éclair. This page includes terms such as éclair, flan and frozen custard. Use this index bar to visit the appropriate glossary section. A finger-shaped pastry made of pâte à choux with a glacé icing, filled with custard or whipped cream. It is known to have originated in France around the turn of the 19th century. 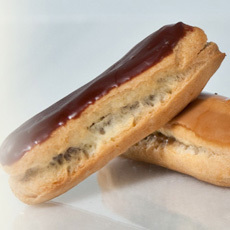 Many food historians speculate that éclairs were first made by Marie-Antoine Carême (1874-1833), the first “celebrity chef,” considered the founder and architect of French haute cuisine, cookbook author, and chef to Talleyrand, the future George IV of England, Emperor Alexander I of Russia and Baron James de Rothschild. Chocolate and caramel éclairs. Photo courtesy Christophe Artisan Chocolatier. The Oxford English Dictionary traces the term “éclair” in the English language to 1861. The first known recipe for éclairs appears in the 1884 edition of the Boston Cooking-School Cook Book edited by Mrs. D.A. Lincoln. “Éclair” is the French word for lightning. It is suggested that the pastry received its name because it glistens when coated with confectioner’s glaze. We would suggest that it is because they are so popular that they disappear as quickly as lightning. The name for crème caramel in Spanish-speaking countries. It is the national dessert of Spain. In Mexico, dulce de leche is often used instead of caramel syrup. See the photo at the top of the page. A second meaning for flan is an open face pie, similar to a tart, filled with pastry cream and covered with fresh fruit. 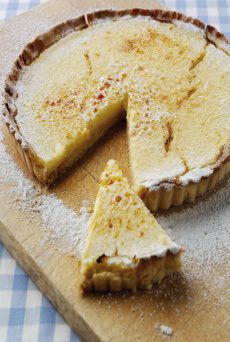 A tart filled with custard or pastry cream is also called a flan. Photo courtesy FAGE. 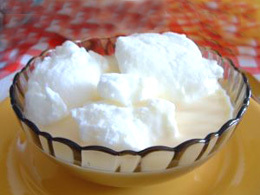 Also known as oeufs à la neige, “snow eggs,” a delicate dessert of stiffly beaten, sweetened egg white mounds (meringue “islands”) that have been poached in milk, then floated in a thin custard sauce. In France, île flottante, “floating island,” is a liqueur-sprinkled sponge cake spread with jam, and topped with nuts and whipped cream, surrounded by a pool of custard. Cocoa powder and confectioner’s sugar can be added to whipped egg whites to make chocolate floating island. Floating Island. Photo courtesy SXC. Almond custard filling, a thick type of crème pâtissière mixed with powdered almonds or crushed macaroons. It is used as a filling for tarts or crêpes. Ice cream with a cooked egg-custard base. See crème anglaise. NOTE ON “FROZEN CUSTARD”: Means “French Ice Cream,” “French Custard Ice Cream,” ice custard, parfaits and similar frozen products. In addition to the definition above, it shall also contain for each ninety pounds thereof not less than (a) five dozen of clean wholesome egg yolks, (b) one and five-tenth pounds of wholesome dry egg yolk containing not to exceed seven percent of moisture, (c) three pounds of wholesome frozen egg yolk containing not to exceed fifty-five percent of moisture, or (d) the equivalent of egg yolk in any form. 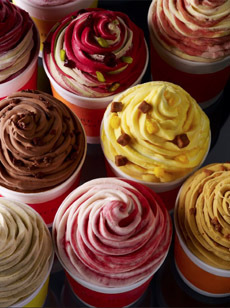 Frozen custard originally referred to ice cream made with egg yolks (eggs and cream are the base of custard). Today, it usually refers to soft serve, a later use of the term. Photo courtesy Pierre Hermé. For more on frozen custard, see our Ice Cream & Frozen Desserts Glossary and the History Of Frozen Custard.